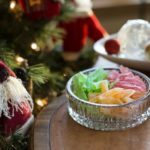 How to make old fashioned hard candy is so easy. It makes a perfect office gift for the Holidays, or really any occasion. In a heavy pan, mix sugar, water and corn syrup. Heat on medium on the stove until the temperature reaches 300'F. Transfer contents to glass heat proof container. Slowly pour contents into the troughs. Allow the strips to cool, then break apart and place in containers. I like to place different flavors in different containers.